What is the True Power of Collective Economy? Gone are the days when you would work on your own to try and start a business or have to balance limited resources in order to really make an impact. In the near future, instead of doing things on your own, you will join forces with thousands of others to collectively transform the lives of everyone involved in the endeavour. They say 100% of your effort is nothing compared to 1% of the effort of 100 people. More than a 100 years ago, Rockefeller understood the power of people. He knew that all he had to do was increase the number of people who made money for him and consequently his wealth would increase too. This is true even today – companies that have larger numbers of people working for them can only afford them over extended periods of time because they are making money from them. Simply put, the combined power of many makes you money. This is true for both private companies and publicly listed companies. The more shareholders a company has, the more money it has and the more resources it can deploy towards growth. We believe publicly listed companies used only half of the power of what people have. They only deploy people’s money to make themselves rich and benefit those who bought their shares at the right time. For example, Facebook Inc.’s P/E ratio for today is 36.18. Most companies currently do not take full advantage of the “People” aspect. Collective economy, however, changes all that. Let me prove this with an example, so there is no doubt left at all. Let’s say you are a 100 times smarter than your 12 year-old cousin. The two of you start two separate businesses of your own. The two businesses (let’s say they are restaurants) are in the exact same industry and location. One has been started by you working alone, while the other has been started by your cousin. You are 100% smarter than your cousin and you start a business on your own with your money and your knowledge. Your cousin, meanwhile, joins forces with 1,000 people in that area whom he takes on as his partners (these people are from all walks of life – doctors, lawyers, restaurant owners, businessmen, teachers, families and people who love to eat). These 1000 people contribute a small amount, and collectively it is used to launch the business. Each of the 1000 people spend two hours a day working for the business and promoting it. They also agree that whenever they or their families need to eat out, they will eat at your cousin’s restaurant. Which of the two businesses is going to do better? Your 12 year-old cousin’s, or yours? I’m sure you will conclude that your cousin’s business will do much better than yours, and your 12 year-old cousin will make far more money than you will by working on your own. There are no ifs and buts about it. This is the power of Collective Economy. Let’s say you have another cousin aged similar to you. She is very smart, and has created many successful restaurants spanning a period of 16 years. There is one particular type of restaurant she started, which in the last 16 years has never failed, although she has launched thousands of branches for it. There is no doubt she knows what she is doing in the hospitality business, and she has made a fortune from it. The two of you start two separate businesses. These two businesses (let’s say they are restaurants) are in the exact same industry and location. One has been started by you working alone, using your own knowledge and money. The other, meanwhile, has been started by your smart cousin. She joins forces with 1,000 people in that area whom she takes on as her partners (these people are from all walks of life – doctors, lawyers, restaurant owners, businessmen, teachers, families and people who love to eat). These 1000 people contribute a small amount, and collectively it is used to launch the business. Each of the 1000 people spend two hours a day working for the business and promoting it. They also agree that whenever they or their families need to eat out, they will eat at your cousin’s restaurant. Your smart cousin’s, or yours? I’m sure you will conclude that your cousin’s business will do much better than yours. Your smart cousin will make far more money than you will by working on your own. There are no ifs and buts about it. Even the not-so-smart people will do better in the collective economy because there is a vast amount of experience and knowledge among the 1000s of members. They all work together for the betterment of each other. As soon as you are plugged in, you immediately start reaping the rewards. A releasing event can change lives, and if you really want your financial situation to change for the better, you have to try something different. Something which will allow you to be successful despite all of your shortcomings. Something where total strangers will come together to help you grow, simply because your growth means their growth. Imagine having 1000s of friendships founded on business, where everyone has the same collective direction in mind. As stated above, Collective economy is going to change the world. Those who take advantage of it are going to transform their lives. Why? Because the basis of the idea is that it allows everyone to win. Everyone in the cluster puts in minimal contribution and effort but still comes out a winner, because you are working with each other as opposed to working against each other. You are not employees or consultants – rather, you are all owners. In the case of Leverage, we are led by highly experienced internet millionaires who have multiple successful ventures to their credit. HQ, RM, HR, and CM have all succeeded in starting businesses. RM has started a venture known as the Content business, and during the last 16 years, there is not a single content business RM has established which did not make money. Collectively, the profits from each of these Content businesses add up to a lot. The knowledge, resources and track record speak volumes. RM’s real strength is finding opportunities based on math and taking advantage of them. With his brothers, RM was able to take advantage of domain names, crypto currencies (one of the early ones in Bitcoin), Sharing Economy and now his math has led him to formulate the ultimate business model – “The Collective Economy”, which is based on “Unity”. 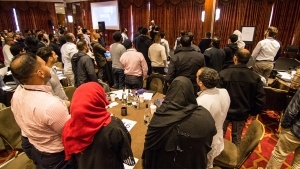 The “Collective Economy” model was displayed on April 1st and 2nd this year when the first 300 people came together in London, UK, under the banner of the Leverage program. It was an amazing event filled with fun, learning and Unity building. We all came to the event as individuals and left as a whole. The Unity among the group is a powerful force; not only does it strengthen the group on the business front, but it is also apparent in the way group members extend support to each other on a personal level. What has the Leverage family learnt so far? Collective knowledge from those who have successfully launched multitudes of profitable ventures created a clear road map for the Leverage program. Each Leverage family member agreed to spend 2 hours a day working towards the collective goal. What they do in these 2 hours is determined by precise calculations and the think tank behind the collective initiative. The group members came from all walks of life, but now they know exactly how to use content to attract traffic. The topics they write on are determined by the math model based on what people will be searching for. Through the Leverage program, members have learnt what sort of content is geared towards making money, and which important factors need to be considered when producing that content. We call content that makes money “Anchor posts” (APs), and we have already created more anchor posts for health and fitness in London than all other health and fitness companies combined. Group members have also learned how to put this content together from a comprehensive step by step example provided by the program. They are now able to get their content ranked by using the method shown, but our SEO team also works day in and day out to get content ranked. Google took the search engines world by storm more than 10 years ago and still holds a strong monopoly. PageRank is the basis of ranking sites. PageRank (PR) is an algorithm used by Google Search to rank websites in their search engine results. PageRank was named after Larry Page, one of the founders of Google. PageRank is a way of measuring the importance of website pages. Google has 10 organic results on its front page (not including ads). In reality it works blindly and does not really know which result is more important than the other. To solve this problem, Google too relies on “Collective Actions”. It looks at the clicking habits of people and sees which results get the most clicks. For example, if you search for – why Islam is spreading so fast – currently the number one result is MuslimsInc.com, which previously used to be number 7. Over time, as more and more people clicked on the results, “Collective Actions” got Google’s ranking algorithm to push the result higher and higher. Even when a link from one of the leverage sites is placed lower down in the search results, it is sure to move up in rankings when 300 people from 300 unique IPs search for a keyword and then click on that particular result. Imagine how much quicker and greater the impact on rankings will be when the Leverage family is 5,000-strong. 5000 people with unique organic IP addresses searching in Google based on our own math model for “What to search” and “When to search it” will ensure that any link we choose can dominate the search results in no time. We have the force to utilise the “Collective Actions” variable for Google to act in our favour. There is no point bringing traffic to a page or site which offers no real value to people. We make sure the content we post and create is built to solve people’s problems. We call these Anchor posts “Now Money”. These APs not only provide real value for solving people’s problems, but also go way beyond in helping them do so. Even a single AP can make thousands of dollars provided that it offers a solid solution that works. This is just the search part. Collectively, on social networks, the 300 already have more reach than some of the largest marketing agencies in the world. Once anyone is plugged into the Leverage family, they will be able to benefit from the knowledge, resources and connections from day one. By now you should have a very good idea of how powerful a “Collective Economy” model can be and I’m sure you agree that it has huge benefits. You may have questions which need answering and we would love to help. Please ask your questions in the comments section below. We have been talking to thousands of people, and have been listening carefully to their feedback, suggestions, concerns and ideas. We will be publishing a detailed QA based on our discussions with people. We want to make sure that by the time you come to the final Webinar, you are fully aware of what the opportunity of Collective Economy is, and that any questions you might have are answered. Before that, you will see the millions we spent in building the background and framework for Unity, designed to enable us to work together and dominate industries. Within the next seven days, we will also publish a benefit so huge and beautiful, all you will say after seeing it is Subhan Allah. You will say: If this is the basis of Unity, if this is how Muslims are to work and if this is how we take care of each other, may Allah let me become part of this Leverage family and make it easy on me to help other brothers and sisters do better in life. Regardless of what your stance is currently, IA we know that within the next eight days you will see the world in a different way. You will see the possibility of your life changing for the better right in front of you. At this stage, we ask you for a simple favour – please comment below, and let us know about your thoughts on Collective Economy based on Unity. P.S: Please share this with others so you have more opinions from people you care about and give others a chance to come see “what the start of something special looks like”.